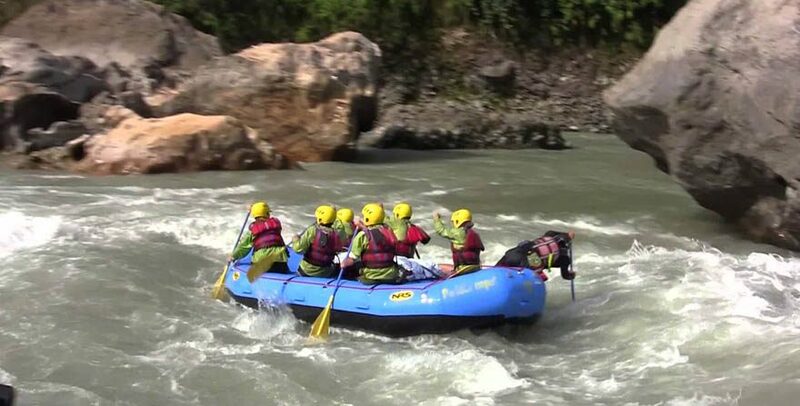 The Trishuli River Rafting is Nepal’s most popular rafting river. It has impressive gorges, some easier sections, all easily accessible from Kathmandu and Pokhara. Popular also with kayakers as an easy access ‘play river’ and as a warm up for big water. Not however, that the proximity of the main highway and the popularity of the river may detract from the experience. Legend says that high in the Himalaya at Gosainkund the god Shiva drove hios trident into the ground to create three springs – the source of the river and hence its name Trishuli. Not far after this source the Trishuli joins the Bhote koshi that flows from Tibet; the two rivers joining in some pretty fearsome looking gorges that are visible on the way up to the Langtang trek. By Betrawati the gradient has eased and after this it becomes a more mature and powerful river. This later adds many other major rivers to its flow – the BuriGandaki, the Marshyangdi, and the Seti. When the Kali GandakiJoins it, shortly before the plains, it changes its name to the narayani. The powerful whirlpools when the river runs high and wild. The rapids in the Trishuli river are even given a name like Snail’s nose, Teendevi, Malekhu rapid, Monkey rapid. In addition Upset, Surprise, Monsoon, Cotton Pony, Ladies Delight, S-Bend, Highway, Monsoon and Pinball Rapid. The name of the rapids gives us an idea about how the rapids will be like. Bharal Adventure assures you to make the journey one of the best journey of your life just in 2 days. Kindly check the details, cost info and others in your favor. We wake up early in the morning and treat ourselves with tea or coffee. We get reloaded with our gears and head for our next paddling journey. We enjoy the rapids of water for next three hours and enjoy our lunch and Mugling. We further raft until we reach Simaltal and conclude our rafting journey. Then you may drive to Pokhara/Chitwan or drive back to Kathmandu. Tips for rafting guide (Tipping is Expected).